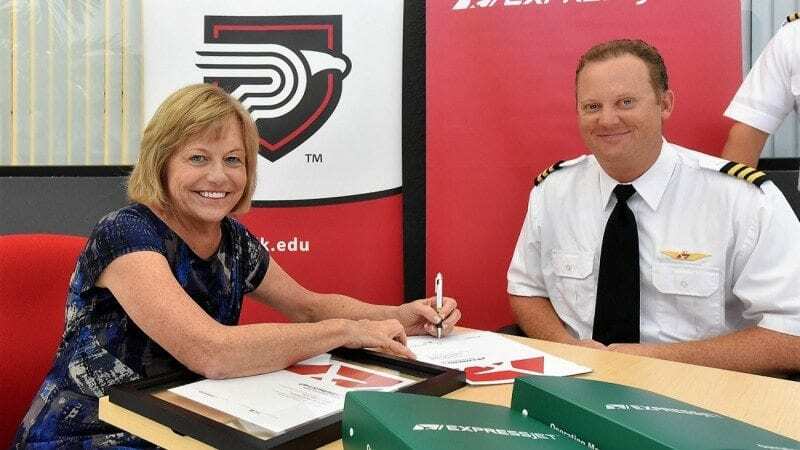 Polk State President Eileen Holden and ExpressJet First Officer and Pilot Recruiter Jared Allison celebrated a new partnership on Tuesday that will give Aerospace students access to ExpressJet mentors and preferential hiring benefits. Polk State College and ExpressJet, one of the world’s largest regional airlines, celebrated their newly formed partnership during a ceremony Tuesday at the Polk State Airside Center in South Lakeland. Among those attending the event were Polk State President Eileen Holden, Trustee Ricardo Garcia, Polk State Aerospace Program Director Eric Crump, representatives from ExpressJet, as well as those who will reap the benefits of the new agreement — Polk State Aerospace students. “With this agreement, we have a clearly defined pathway to becoming an airline pilot,” said Polk State Aerospace student Nathan Calhoun, a Lake Wales resident studying toward his Associate in Science degree in Professional Pilot Science. Tuesday’s ceremony was held in honor of a memorandum of understanding the College and ExpressJet recently signed marking the official start of their partnership. Under that agreement, Polk State becomes one of approximately 50 colleges and universities in the nation participating in ExpressJet’s Airline Pilot Pathway Program, or AP3 for short. Through AP3, ExpressJet pilots will mentor Polk State Aerospace students. Additionally, Polk State Aerospace students will enjoy preferential hiring benefits with the airline. ExpressJet representatives will also have a place on the College’s Aerospace advisory board; advisory board members help guide program curricula, ensuring that students are receiving the training employers need. Atlanta-based ExpressJet is one of the world’s largest regional airlines, with 8,500 aviation professionals, an average of 1,600 daily flights, and an all-jet fleet of 320 aircraft. ExpressJet operates as American Eagle, Delta Connection and United Express to serve more than 170 airports in the U.S., Bahamas, Canada, Cayman Islands, Mexico, and Turks and Caicos Islands. At the event, Holden said the agreement with ExpressJet is “a perfect example” of the College’s founding mission to serve its business and industry partners. “This partnership is about us filling employment gaps in the aviation industry. You have our commitment to excellence,” Holden said to the ExpressJet representatives. Matt West, a chief pilot with the airline, encouraged the students to take advantage of the AP3 program. 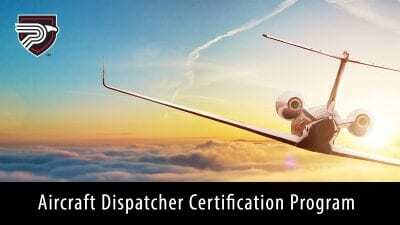 “Not only is ExpressJet an excellent stepping stone to meet your goals, it’s also a great place to call home,” he said. Among those who plan to sign up for the program is Trae Lefan, an Auburndale resident who will graduate next year with his Bachelor of Science in Aerospace Sciences. “This program will give me a mentor. It will connect me with someone who can tell me what I need to do to be prepared for this industry,” he said.